Recently my husband and I came across a binge-worthy Netflix series called “The Kindness Diaries.” In episode one, a Los Angeles resident named Leon leaves the land of materialism to travel the world. His journey begins with only a few basic pieces of clothing and no money. 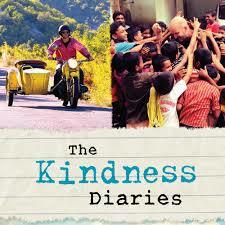 His mode of transportation is his 25-year-old BMW motorcycle that he affectionately calls Kindness One. Leon’s hope was that those he encountered along his journey would be kind and compassionate. He wanted to believe that people, at their core, would have these traits. That was not always the case. Leon didn’t need much, but what he needed most was kindness. The kindness would need to come in various ways—a tank of gas, directions, a meal, someone to talk to, or a place to sleep for the night. What Leon discovered was that no matter where he traveled, his journey may not be easy, but if he looked hard enough, he could find just enough kindness to continue his journey. In the end, both Leon and Kindness One, were literally and figuratively fueled by the kindness of others. What we found most interesting was that the majority of the kindness Leon found came from those who had the least to offer. Those who were poor or even homeless opened their hearts to Leon. Those stories really touched our hearts.